As already mentioned, we started very early in the morning to Prague, we even could get breakfast half an hour earlier at 6.30. Suitcases packed and in the car, we had checked out the night before after dinner. Thus, we only had to return the keys and could get started. 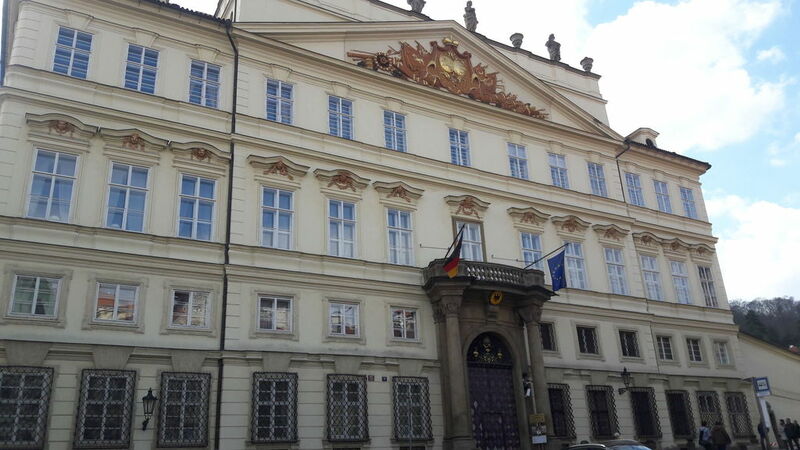 As expected, on a Sunday morning, the roads were empty and it took less than 90 minutes to arrive at our hotel in the city centre of Prague, where we were excepted at reception. They were very friendly and helpful, Zbinek in particular who also spoke German fluently and gave many good advice. Also, our room was ready, very modern and well equipped, but a little small. 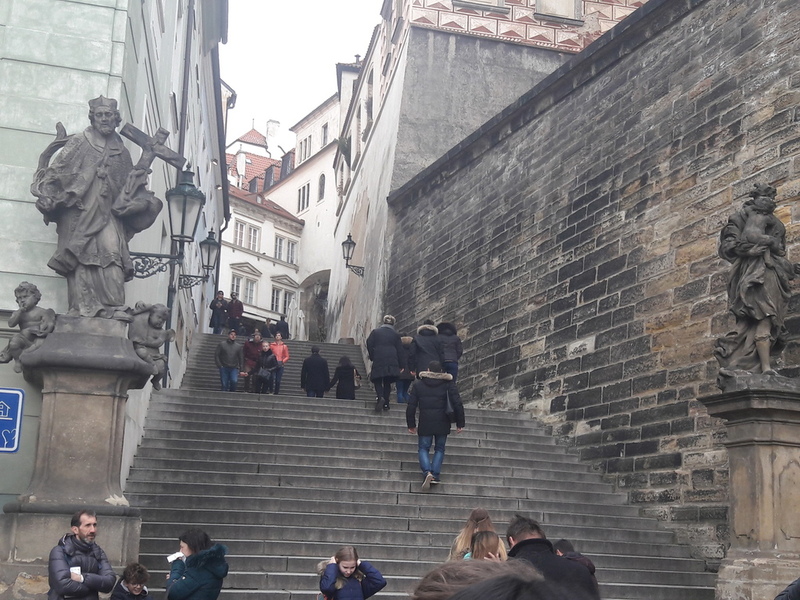 For the City Tour, we were picked up with a big bus that took all through the city uphill to the castle where we met our guide, Michail, who took us through Prague's history. Unfortunately, we couldnd't enter the dome in the castle because it was Easter Sunday and a mass going on. We continued along the windows of the famous Defenestration of Prague to the garden terrace where we had an awesome view to the city. 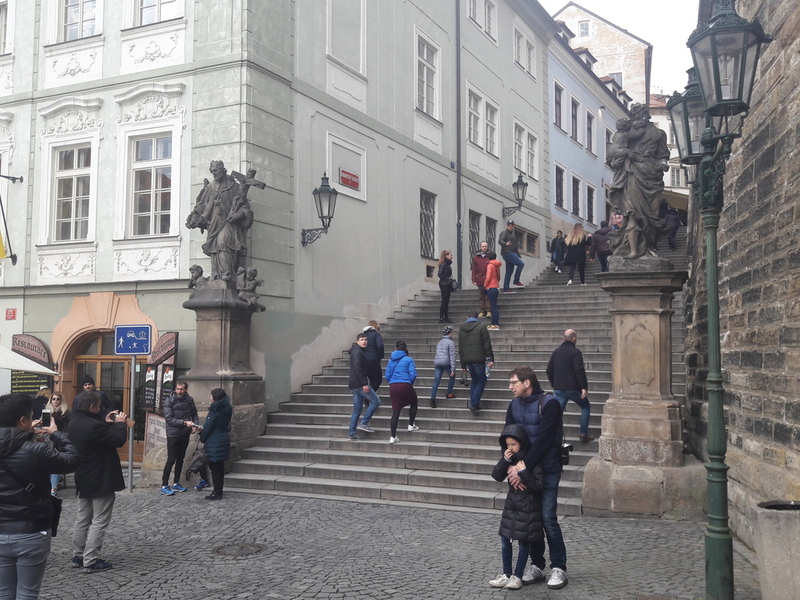 Then we started downhill towards historic town and I almost immediated discoverd the famous Prague steps Radnicke Schody from season 2 where Claire left the carriage and ascended to the pharmacy of Maitre Raymond. 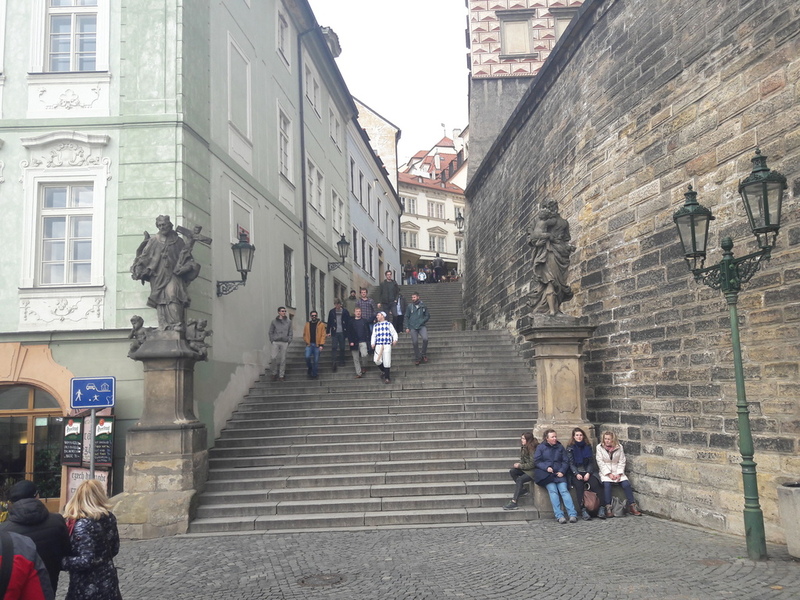 Downhill on steep and cobbled roads through the western historic city towards Moldau river and Charles Bridge. 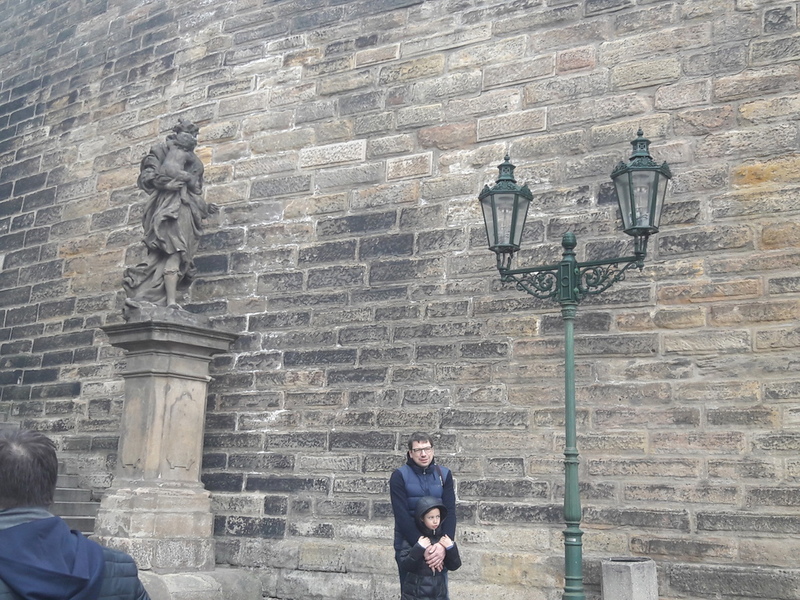 Of course, I could tell so much more about Prague and upload more pics (we have almost 1000? ), but I want to purposely limit myself to the Outlander aspect. Except to say that the City Tour is extremely recommendable, can be booked in various languages, a boat tour with drinks and lunch in a medieval celler restaurant are included and it takes 6 full hours. Price at about 55 € per person, absolutely appropriate. After a rich breakfast in our hotel restaurant, we packed our suitcases and left them in the hotel until afternoon. The weather had improved, the sky was more clear and it was less windy. Our main destinations were the shooting places of my list. We started with the underground towards castle hill, took the last part uptill on foot and decided impulsively to visit the castle complex once more, without guide and in peace. It was no mass on Monday morning, so we could visit the dome which was much too crowded. Very interesting, the main master-builder then had come from Cologne, that's why the dome in Prague is a smaller copy of the dome in Cologne. Leaving the castle, we continued uphill to the church Vojensky kostel svateho Jana Nepomuckeho. The front side was used representing the Hopital des Anges (while for the inside, they used the lower crypt in Glagow Cathedral). Not far away from this church is the Strahov Library next to a monastry church. Here you have to keep in mind that they don't sell tickets from 11.45 to 13.00. Foto permission supplementary - per person. Entry to the big halls is blocked and you can only shoot pictures from outside, entry is supplementary as well and needs prebooking. This is the place where Jamie played chess with the minister of finance and Claire got poisened. Extremly beautiful and worth seeing! From high on the hill, we had a first class view onto the huge historic town, also to the famous German embassy. 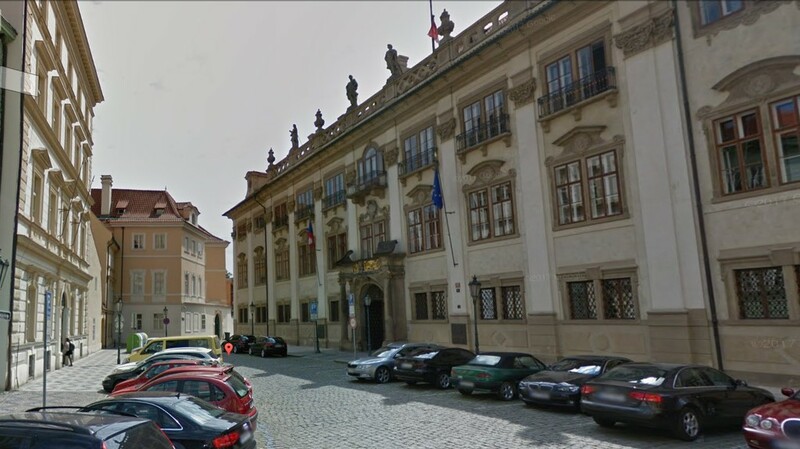 And last but not least, the city house of the Fraser family, located 3 blocks west on the Malteska nam road. 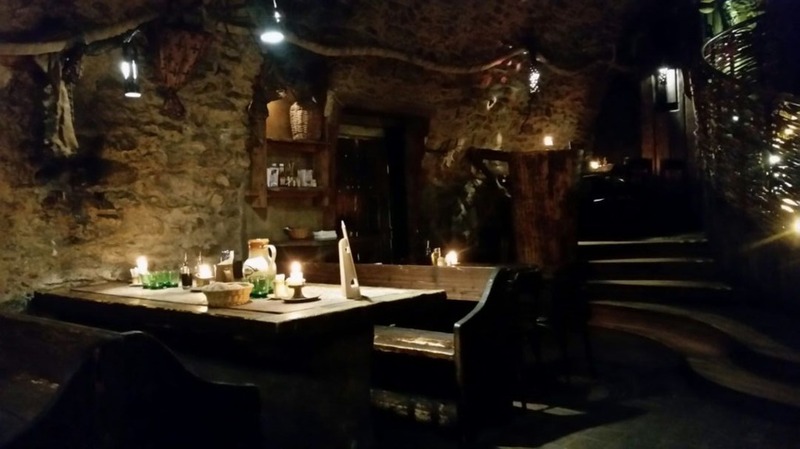 Eventially, we had Lunch in the medieval restaurant O Pavouka, before we hit the road home to Germany. 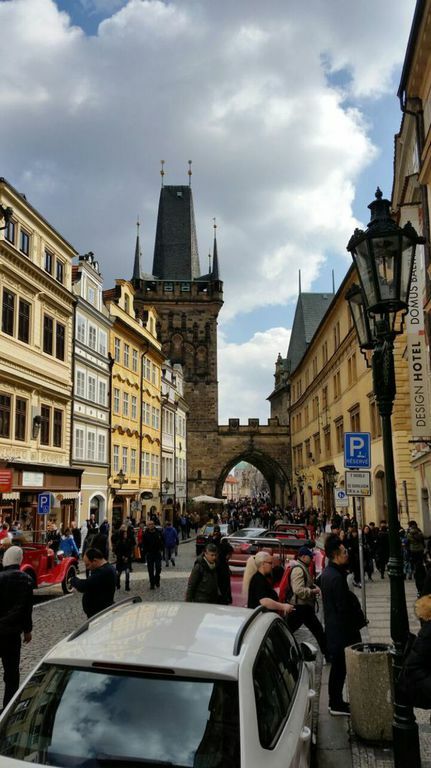 For sure, Prague will be worth another visit!